Situated in the tranquil lands of Berkshire, this week’s property is the epitome of luxury and modern living. This extravagant party home is spread across three spacious floors and features a cinema room, sauna and a remarkable indoor pool. 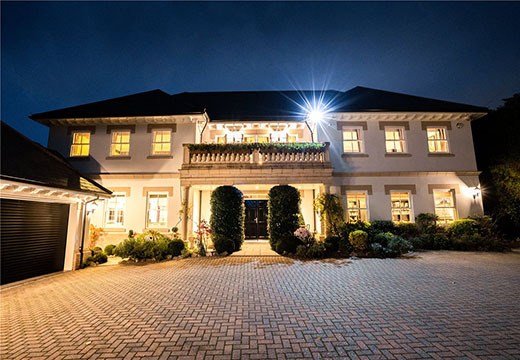 Located in the southeastern corner of the Royal Borough of Windsor and Maidenhead, this house has one of the most reputable addresses in the country. Over the last 10 years, the current owners have done extensive renovating to create a contemporary feel. A sophisticated grey and beige colour scheme can be found throughout the property enhancing the luxurious ambience. Upon entering through double doors you are welcomed by a huge reception hall with the grand staircase as the focal point. To the right of the reception hall, there is a library, lounge, dining room and office with tailor-made furniture. The lounge and dining room provide direct access to the terrace and rear garden. The ground floor also features a cinema room, plant room, changing room and triple garage. A bright and airy kitchen/ breakfast room is also found on this floor. It includes high specification integrated worktops, appliances and a central island providing a perfect space for entertaining guests at dinner parties. The showstopper of this property is the outstanding indoor swimming pool. This room also includes a bar and an indoor gas BBQ making it the perfect venue for entertaining. Moving up to the first floor there is the master bedroom with his and hers dressing rooms and an ensuite bathroom including a calming jet bath, automatic toilet, a sauna, steam room and it’s very own balcony. There are a further three bedrooms all with ensuite bathrooms, a laundry room, a gym and a balcony overlooking the front parking area and striking gardens. The second floor is perfect for a live-in nanny; it is a self-contained space with an open plan kitchen and living area. There are also two bedrooms both with ensuite bathrooms. There is plenty of security in place, with CCTV and electric gates guarding the property. Outside of the estate, you can find well-kept mature gardens adding to the luxury feel of this property. This property is on sale in excess of £4,750,000 via Winkworth.